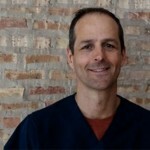 Dr. Tom MacNeill, D.C. has been practicing chiropractic care in Chicago since 1997, focusing his treatments on structural and functional issues involving the skeletal and muscular systems. His practice is results driven. His approach is client-centered, sensitive, and empowering, and emphasizes the body’s innate capacity to heal. He uses gentle chiropractic adjustments for restrictions within the spinal joints. Dr. MacNeill specializes in using myofascial massage (multilayered deep tissue) techniques created through his 14 years of experience to improve the counterbalance issues inherent in biomechanical conditions. Dr. MacNeill believes that core integrity, postural strength and flexibility are required for long term results. He educates his clients and empowers them to better sense, understand and respond to their bodies on their own in order to promote sustainable health and wellness. Dr. Tom MacNeill first entered the health field while in undergraduate school at Springfield College, MA. where he earned a B.S. in Sports Medicine; taking an entire year off to work as an orthopedic/rehabilitation physical therapy aide which was an experience that cemented his desire to diagnose and treat patients with direct access to his services. Dr. MacNeill earned his Doctor of Chiropractic D.C. degree in 1997 at the National University of Health Sciences in Lombard, Il. Dr. MacNeill’s post-graduate training includes certifications in acupuncture/meridian therapy, chiropractic sports physician, trigger point and kinesiotaping and he believes that these modalities allow him to treat patients very differently and unique to their issue. Dr. MacNeill is certified in manipulation under anesthesia and continues to research in the field of functional medicine and nutrition and founded and owned of Today’s Chiropractic and Yoga Wellness Center prior to joining the team at Chiro One in Hyde Park. Chiropractic is a natural health approach the emphasizes proper movement of the spine and related structures. The chiropractic philosophy is based on the idea that the brain and spinal cord system plan an integral role in health and healing. Spinal integrity though manipulation, exercise and functional therapy can help create a stress free environment for the sensitive neural structures. Chiropractic work is a hands on, holistic approach to restoring the body’s balance and innate functioning and can treat conditions such as: neck and back pain, shoulder and hip conditions, disc conditions, headaches, sports injuries, chronic orthopedic conditions, tendonitis and other issues associated with muscular inflammation. Modalities within our treatment session might include – spinal adjustments, myofascial massage, therapeutic exercises, de-compression therapy, acupuncture, nutritional counseling and physiotherapy. I strive to create a a safe space in my office for patients to work with and address the various physical, emotional and energetic effects that may surface or be released through chiropractic work. I practice patience, flexibility and compassion in my treatment approach to ensure clients feel comfortable with me and the treatment. I also listen very carefully to my clients’ symptoms in order to effectively address and work collaboratively with them as unique individuals and importantly, to facilitate healing at a pace and in a manner that feels both sustainable and comfortable for them.